Three (3) decades ago, a charismatic lass from Bulacan charmed the country and effectively made athletics a popular sports in that generation. Lydia de Vega together with the Gintong Alay athletes carried the torch of athletics that attracted thousands of young kids (including the writer) to the sports. With her retirement in the late 80s, the popularity of the sports went down as well. Less than a decade ago, a charming young girl emerged from the tracks of Rizal Memorial. Not only does she possess the Filipina exotic beauty, she is also an intelligent kid who graduated from De la Salle University. If RP athletics need a poster player to attract the young generation to take up the sports, I would bet my retirement on Sheena Atilano. Pinoymiler: How did you start in athletics? Why pick athletics over other sports? Sheena: I started when i was in grade six. It was because i had the longest jump in our activity in P.E. class. My teacher let me join in a district track and field meet and from there to palarong pambansa where i got first place in all meets. May i say i’m kinesthetically gifted. I’ve tried and joined in several sports which i think i could excell too but i think it’s just maybe i was first exposed in athletics. P: Among your medals, what’s the most important/cherished? Why? S: It was my bronze medal in 100m hurdles where i got in 2007 Asian Grand Prix. I cherished that most because first and foremost i broke the 16 yr old record of Elma Muros-Posadas. I have been in the limelight in our country as well as among my fellow hurdlers of ASIAN countries. I gained trust and respect among my fellows and as well to other people who are concerned. P: Do you still have unfulfilled dreams in athletics? S: Yes, i’m hoping i can do this season. P: Can you expound on that? S: I could have had a gold medal last 2007 but unfortunately i was injured a day before my run. P: The Philippines stature at the Asian level has continued to deteriorate in the last couple of decades as against our heydays in the 1930’s to 1960’s. What do you think are the solution to this? S: Very simple! Continuous and long-term effective athletics program. Easy to say but unfortunately cannot be done. 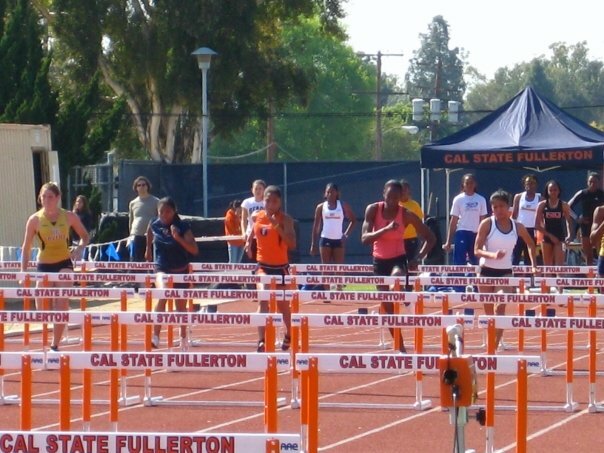 P: Among the college and high school players, do you see anyone breaking your 100m High Hurdles records? S: As of now, i couldn’t really tell and see anyone breaking my record. But i would say that we have a lot of potential athletes here and i believe if they are given a chance to have a proper training program and ample support, maybe lots of records will fall. P: Who’s your idol at both international and domestic level? P: What were your secrets in conditioning and avoiding serious injuries? S: Having the right discipline during and after training time. Making sure to have enough rest. Of course, always doing the right thing like proper warmup and strecthing before and after exercises will be the best way to avoid injuries. Also, i make sure to have a good nutrition. P: Coach Jerry Cablayan thinks that you are the most complete athlete that he has handled here in the Philippines because you’re also competitive in the high jump and long jump. Why did you not pursue the heptathlon? S: I rather choose a more specific event. What matters most is knowing yourself and believing in something you could excell at. P: What are your personal goals for the next 3 years, for your family and for RP athletics? S: I see my self teaching in a preschool or special school.. I’ll continue to be acquainted in this field and if given a chance, to be part of the coaching staff in RP athletics would be a great pleasure. P: What can you give as an advise to our high school and college players as they pursue their athletic dreams? S: When i was in my high school and college, running wasn’t really in my heart seriously. It’s just fun and a way of socialization for me. i realized late in my career that it could somehow open more opportunities for me and that i really have a unique talent which could distinguish me from others. While you are young, use and maximize your full potential to develop your talent because our sports career isn’t for a lifetime. Always be patient as you could experience tediousness in the progression of your performance. In everything you do, always think and aim for excellence. 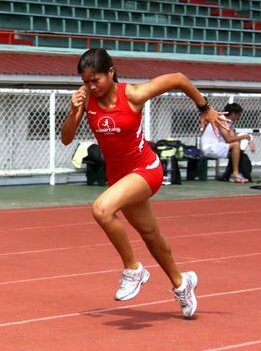 Sheena is a fulltime national player and is assisting in coaching the DLSU track team.